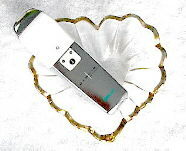 Facial Stimulation is the key to healthy tone, increased Circulation and Radiance. Gentle stimulation provides such benefits to the Face.These compact Facial Exercisers improve the underlying Muscle Structure of the Face through electronic stimulation. This device is a Facial Muscle Exerciser in that it contracts and relaxes the Facial Muscles. These devices have been used for decades in Hospitals throughout the World to stimulate Nerves and small Muscles and improve healing. Doesn't it make sense that this could work to help revitalize the Facial muscles as well?Facial Stimulation is the Key to healthy tone, increased circulation and vibrance. Gentle stimulation provides such benefits to the face. This product is going to change your Life and your Face for good! Effective at stimulating your Facial Muscles, working the underlying Face Muscles with gentle electronic stimulation. Exercise contracts and releases the muscle. That is exactly what this mild electrical pulse does for the Muscles of your Face. 'Facial Exercisers' are used to improve the appearance of the face at World wide Spa's and Beauty Salons. Electronic Facial Exercisers at a fraction of the cost. Take care of yourself. Personal, convenient, portable and thrifty. No one likes to think of themselves as growing older. Yet, changes do take place, gradually and surely. Unfortunately, the face shows signs of aging first because of changes taking place in the underlying network of muscles. The face and neck are the only areas of the body where the muscle is directly connected to the skin tissue. As these muscles lose their elasticity and strength, they pull against the delicate facial tissues, causing them to sag and wrinkle. What can we do? It is possible to prolong a youthful appearance by working the facial muscles, through regular use of special micro-current unit that you can use right in your own home. The Activator Facial Exerciser works to give you a more youthful looking face and skin, by helping to relieve stress and tension that lines and congests the skin. As the face and neck are the only places on the body where the muscles are directly attached to the skin, this passive massage unit may aide in giving your face and muscles a rejuvenating beauty treatment without tugging, pulling, or stressing the skin. Far more attention is put on Facial skin than on any part of the Body. Just as you exercise your Body to strengthen Muscles, Facial Muscles need a Workout too. To keep a youthful Appearance, good Muscle-tone is essential. The activators mild electronic Signals cause selected delicate facial muscles to Exercise (contract and relax) thoroughly. This Scientific method can certainly perform a more effective Facial exercise than Massage. 1.When you grow older, the Facial Muscles begin to lose their youthful elasticity and cause the Skin of the Face to sag and pouch. 1.Sagging around Eyebrows, Cheeks and Chin line. Gently tightening up the Facial Muscles improves sagging Jawline, smooths Wrinkles and generally restores youthful Face-contours. Gently exercise Facial Muscles to stimulate Peripheral Blood Vessels beneath the Skin, and enhance Skin Cell Nutrition to eliminate Toxic Substances. Facial Exercisers are designed for the small Muscles of the Face. The facial exerciser can, of course be used for other areas of the Body, but you will not get the same results that you would get using the heavier and more strenuous devices used for the larger Muscle Groups. The Forehead apply Lotion/Gel to cleansed Skin and begin at the side of the Crown. This is mostly boney area so it is very sensitive to the Facial Exerciser. The Exerciser does nothing for the boney structure, so concentrate only on areas where there are Facial Muscles. The eyes are the most delicate area of the Face, but will show results most quickly with repeated gentle Treatments. Never more than once a day, apply the lightest pressure at least 1 inch away from the Eye, towards the temple. 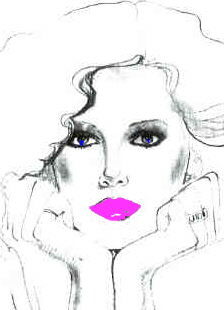 Also apply light pressure under Eye, above the Cheekbone. Your circulation will improve making the Eyes brighter, and give them a more "rested" look. Chin and "Jowl" area are the most problematic for the aging Woman, and at times Men. Apply a Gel-type Moisturizer (Aloe Vera Gel) To Face before use.As you are exercising your underlying Facial Muscles you should concentrate on stimulating a "good vibration" within your Jaw and Neckline. Never more than once a day for approximately 30-60 seconds per area. The Cheek area can stand more of a Workout than your Forehead or Eye-area. Move the device around in the approximate area of your cheekbone and under it, to "pump up" the strong Muscles underlying your entire side of the Face. This area will "plump" up and grow stronger, pulling UP the underlying Muscle structure of the Face, thereby reducing Wrinkles and lifting Sags! Corner of the Mouth work rapidly in an upward circular motion to lift, tighten and firm. Now you can reverse the Aging Process, Technologoly allows us to combat Gravity.The Activator does for your Face, what Excercise does for your Body. 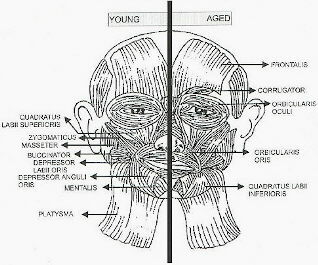 * See Illustration of Young and Aged Facial Muscles. How do I Use the Activator?The Activator is easy to use, on Face, Neck, Throat and even other Muscle groups that need to be electronically exercised. Full directions are included with the Activator, but generally, you use it on several Key points on your Face and Neck, stimulating connected Muscle groups and building firm Facial Muscles. Your face should be moist when using the Activator....an inexpensive gel moisturizer works best (aloe vera gel is fine, too.) Use three to five times a week (but never more than once a day) for 6 1/2 minutes dividing the time among your key facial points.This unit has a built in Timer with automatic shut off. Why doesn't everyone use these units?People around the World have been using this Technology for Years now. The Technology was young and expensive, and therefore many People didn't know about it. Runs on two small Batteries (they are included) and will last 1 Year with 3 times a week usage. How long do I have to use it before I see results?Although you will feel the tug and pull of awakening muscles following the very first use, Real visual results can take as long as 1 month of steady use...However, I have found that the increased stimulation is immediately visible in my skin tone after the first few Treatments...and the Jowls begin to lift after a few Weeks!What is the advantage of this Product over others like it? The Activator is a fully functioning and self-contained ergonomicaly designed unit approximately 5" long 1 3/4" wide and weighs 3oz. with Battery's. Battery operated-Your Activator will operate at least one year on a set of Batteries at regular usage (3 Treatments per Week) a red, low-battery indicator light will begin flashing, when enough power remains for 4 additional regimens. Auto Shut Off-Your Activator is designed with an Auto Shut off Feature. If the Activator is not in contact with Skin for 30 seconds, the Activator will beep twice and and automatically shut off. Shut off will also occur on completion of your Facial regimen, (six and a half minutes) protecting the life of your Battery. To re-initiate the full regimen simply press the ON Button. Safe and easy to clean.Water resistent Body can be easily cleaned with a damp Cloth and the Tip is detachable and washable for easy cleaning.For your personal safety, the Unit has been designed with special circutry to maintain currents at safe limits at all times. It fits nicely in your Hand.It won't scare anyone and easily fits in a Purse to carry and use during breaks or on long boring commutes, or while watching TV. Take advantage of that 'down' time and give your Face a lift!The advantage of using this Product over getting a Facelift is obviously a serious list!It is not invasive, costly, risky, and potentially as embarrassing than Facial Surgery...and allows you to "sculpt" your own face, gradually and privately. It's time for you to gofrom Ordinary to Extraordinary?